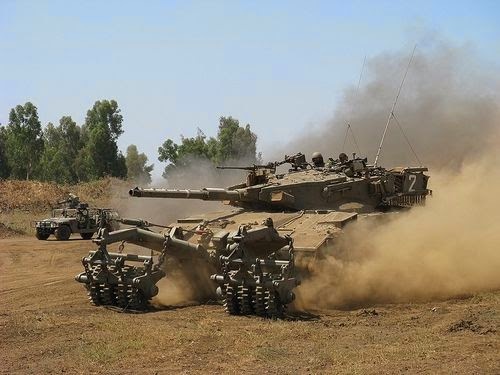 For the first time since Israeli troops entered Gaza in the current “Operation Protective Edge”, Israel decided on Thursday to widen the goals of its offensive, Israeli website Ma’ariv quoted unnamed senior officials in the Israeli security establishment as saying. Israel’s cabinet was expected to convene Wednesday night to green-light a widening of the military operation in Gaza. Widening the offensive could entail entering deeper into Gaza. On Thursday, Israel rejected a proposal by Hamas to hold a humanitarian truce lasting several days. Defense Minister Moshe Ya’alon catapulted the operation’s stated goals to a new level when he said, “The end result of this conflict needs to be clear: Terror doesn’t pay. This terrorist entity needs to be disarmed.” Ya’alon echoed comments made by Prime Minister Benjamin Netanyahu on Monday evening, who also spoke of “disarming” Hamas. Officials in Israel’s security establishment also assess that Hamas military commander Mohammed Deif will oppose any attempt to reach a ceasefire – even if the terror organization’s diplomatic wing agrees. According to the official, from an Israeli perspective, implementing a ceasefire at this point would only bring about a partial resolution. Israel has caused damage to the tunnel infrastructure of Hamas, but on the other hand the terror organization maintains the ability to fire rockets into Israel, has caused a relatively high number of IDF casualties – including one missing soldier presumed dead, as well as triggered a two-day ban on international flights in and out of the country. Implementing a ceasefire now would further send the wrong message to other terror groups like Hezbollah, and indicate that Israel cannot really cope with terror groups armed with rockets and anti-tank missiles. The IDF spokesperson said on Thursday afternoon that during the last 24 hours the military attacked ninety terror targets, including hidden rocket launchers, lookout posts, and mortar infrastructure. In the early morning hours, soldiers from the Paratroopers Brigade identified two terrorists emerging from a tunnel. They were captured for interrogation. Two rows of Gazan captives wearing only underwear and shoes, on their knees in the sand, are shown in an image posted on Facebook by Israeli Transportation Minister Yisrael Katz. They were stripped of their clothes in order to ensure they were not carrying weapons. Photo: Facebook. Paratroopers in the southern Gaza Strip identified a terrorist wearing an explosive vest. They opened fire and confirmed a hit. Two other tunnel openings were found near where the incident took place. Elsewhere in Gaza, IDF troops identified several armed terrorists and fired a shell at them, reporting that the target was hit. Also on Thursday morning, three anti-tank missiles were fired at IDF forces from within the Wafa hospital building which had already been targeted by the IDF on Wednesday. During the fire exchange, two terrorists were killed. The IAF fired at the building from where the anti-tank missiles were launched, and at a building adjacent to the hospital which was used as a storage facility and control center for Hamas. So far, the IDF has found 31 tunnels and completely destroyed nine of them. Additionally, on Wednesday, 150 Palestinian militants in the southern Gaza Strip surrendered to IDF troops near Rafah. It is not clear, however, whether all of the Palestinians were Hamas members.